Super-strong, hi-density poly tape resists stretching and tearing. For indoor or outdoor use; this Barricade Tape will not rot. Can be handled and tied like rope. All messages are printed black on bright yellow poly non adhesive Barricade Tape. Measures 3 inches by 1,000 feet. Barricade and detectable underground tapes feature repeat wording which identifies hazards and can be used effectively to outline restricted areas. Our Yellow barricade tape is 100% polyethylene. Poly plastic flagging tapes are highly visible solid yellow color. Help to maintain access to construction or accident sites with CAUTION Barricade Tape or DANGER Barricade Tape. Prevent pedestrian traffic and show your safety message in any indoor or outdoor environment or event. 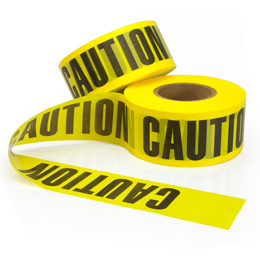 We offer Caution Tape in a variety of wordings and materials suitable for short term or long-term exposure. Super-strong, hi-density poly tape resists stretching and tearing.